4 shows in Tôkyô (Kabukiza, National Theatre, Shinbashi Enbujô), 2 in Fukuoka (Hakataza), 3 in Ôsaka (Shôchikuza, Wahha Kamigata Engei Hall, Shôchikuza) and 1 tour (Kansai)! Kataoka Nizaemon, Nakamura Kichiemon, Matsumoto Kôshirô, Nakamura Shikan, Nakamura Shibajaku, Nakamura Baigyoku, Nakamura Kaishun and Nakamura Fukusuke perform at the Kabukiza! Onoe Kikugorô, Onoe Kikunosuke, Nakamura Tokizô, Nakamura Kanjaku, Ichikawa Danshirô, Ichikawa Kamejirô and Ichikawa Danzô perform at the Shinbashi Enbujô! Nakamura Hashinosuke, Nakamura Senjaku, Kataoka Ainosuke, Nakamura Kantarô and Nakamura Shichinosuke perform at the Hakataza! The Omodakaya guild performs at the National Theatre! A short dance in the oldest style of Kabuki, leisurely and full of humor, combining the charm of an onnagata female role specialist with the larger-than-life heroism of the bombastic aragoto style of acting. The strong woman Maizuru stops the powerful, but rash, warrior Soga no Gorô from rushing to a fight by pulling on the set of armor he is carrying. Starring Nakamura Kaishun and Onoe Shôroku as Maizuru and Gorô. Sumôba: "Futatsu Chôchô" means "two butterflies" and also comes from the fact that two sumô wrestlers who play important roles in the full length play have names beginning with "chô": Chôkichi and Chôgorô. In order to help his master Yamazakiya Yogorô (Ichikawa Somegorô) buy out the contract of the beautiful Azuma (Nakamura Shibajaku), the senior wrestler Nuregami Chôgorô throws a match, letting the younger wrestler Hanaregoma Chôkichi win, hoping to get his help. But Chôkichi loses his temper and the two end up competing in a test of pride. Starring popular actors Matsumoto Kôshirô as Chôgorô and his brother Nakamura Kichiemon as Chôkichi. When people die, it is said that their spirits become butterflies. Having committed double suicide, the butterfly spirits of Sukekuni (Nakamura Baigyoku) and Komaki (Nakamura Fukusuke) dance in human form remembering the time they first met and their love for each other. But their happiness is brief as they are again tormented by hell. Abura no Jigoku: this play has become phenomenally popular in modern times for its hard-boiled sensibility and sensuous killing scene with the protagonists slipping and struggling through puddles of spilled oil, but was virtually ignored at the time it was written. It shows Yohê, the wastrel son of a well-to-do merchant, who constantly tries to borrow money from Okichi, the wife of a neighboring oil merchant. Pressed for funds, he tries to blackmail her, but ends up killing her in the long, dream-like scene that gives this plays its title, "the woman killer and the hell of oil". Starring Kataoka Nizaemon and his son Kataoka Takatarô in the roles of Yohê and Okichi. This is the isse ichidai performance of Yohei for Kataoka Nizaemon! Do not miss it! 3 entertainers dance a tale of the legendary shishi or lion-like spirits that live at the foot of a holy Buddhist mountain. There is a comic interlude with 2 Buddhist pilgrims. Then, the shishi themselves appear and perform their dance with wild shaking of their long manes. The dance shows a parent shishi forcing his cubs to undergo harsh training in order to grow up strong. This theme is often associated with the training a parent actor gives his son and grandson. This performance is a special version celebrating debut of Matsumoto Kintarô IV (the "grandson" cub), Ichikawa Somegorô’s son and namely Matsumoto Kôshirô’s grandson, as an actor. Matsumoto Kôshirô and Ichikawa Somegorô perform the roles of the parent shishi and the "son" cub. Banzui Chôbê: in the early Edo period, gallant men like Banzuiin Chôbê led the commoners. But this incurred the wrath of members of the samurai class, who were theoretically in control. This play begins with a recreation of Kabuki in its earliest days, then a fight breaks out which is settled by Chôbê (Nakamura Kichiemon). But this frustrates the ambitions of the samurai Mizuno (Kataoka Nizaemon) who invites Chôbê to visit. All of Chôbê's men tell him not to go because it is a trap, but Chôbê decides to meet his end and bids farewell to his wife (Nakamura Shikan) and son. Finally, Chôbê is killed when he is defenseless in the bath. Kamiyui Shinza: Shinza is a barber that goes from door to door, but at the same time, he is a villain that kidnaps Okuma, the beautiful daughter of a wealthy household, and even resists the efforts of Yatagorô Genshichi, the most prestigious strongman in town, to get her release. Starring Matsumoto Kôshirô as Shinza, Ichikawa Komazô as Okuma, Nakamura Fukusuke as Chûshichi and Nakamura Karoku as Yatagorô Genshichi. Kinkakuji: "Kinkakuji" retains the epic scale of plays adapted from the Bunraku puppet theater and is full of miracles and larger-than-life characters common on the puppet stage. It is full of the classical forms of all kinds of stylized characters and the role of Princess Yuki is considered to be one of the most difficult and beautiful roles for an onnagata female role specialist. Matsunaga Daizen (Kataoka Ainosuke) has defeated the Shôgun and has set up base in the Golden Pavilion. The brilliant strategist Hisayoshi, disguised as a disgruntled retainer named Tôkichi (Nakamura Kantarô), pretends to come under Daizen's employ to try to sabotage his plans from within. Princess Yuki (Nakamura Shichinosuke) is being held prisoner by Daizen, but is able to free herself by drawing a mouse in the cherry petals of the tree that she is tied to. It comes to life and chews the ropes holding her. Featuring also Nakamura Senjaku in the role of Kanô Naonobu. Ômi no Okane: Okane was a famous strong woman living on the shores of Lake Biwa and is known for stopping a runaway horse with her bare hands. This has become a Kabuki dance that combines strength and charming femininity. This production stars Nakamura Kantarô as Okane. Omatsuri: Nakamura Hashinosuke as a gallant fireman boss at a festival telling a rueful tale of failure in love and showing the vigorous work songs of firefighters. In the pleasure quarters, the most important possessions were money and reputation. In danger of losing his lover, the courtesan Umegawa, the money courier Kameya Chûbê breaks the seals on a package of money entrusted to him after being taunted by a rival, even though the use of such money is punishable by death. Starring Nakamura Senjaku as Chûbê, Nakamura Shichinosuke as Umegawa and Kataoka Ainosuke as Chûbê's treacherous friend Tanbaya Hachiemon. Masago no Shiranami: this play is very similar to Wakatake Fuemi and Namiki Senryû II 1789 drama "Konoshita Kage Hazama Kassen", from which it takes several scenes focusing on the larger-than-life vilain Ishikawa Goemon and his fight against his arch enemy Mashiba Hisayoshi. This spectacular drama, full of actions and stage tricks, include two famous scenes, the "Sanmon" scene and the flying basket scene which ends "Ishikawa Goemon". Starring Nakamura Hashinosuke, Kataoka Ainosuke, Nakamura Kantarô and Nakamura Senjaku in the roles of Ishikawa Goemon, Mashiba Hisayoshi, Nikki Tarô and Omine/Kofuyu. Fuji Musume: the spirit of wisteria blossoms dances of love in the form of a beautiful young maiden. One of Kabuki's most famous and colorful dances, it will feature the dancing skills of Nakamura Shichinosuke. Source: Earphone Guide website, except "Masago no Shiranami"
"If music be the food of love, play on!". The trouble caused by love is the theme of Shakespeare’s play, a comedy with great depth. June at Shinbashi Enbujô features an encore performance of a bold experiment. Ninagawa Yukio, known throughout the world for productions of Shakespeare and his blending of traditional and modern theatrical techniques will direct Kabuki actors in an adaptation of Shakespeare’s "Twelfth Night". After being shipwrecked and being separated (presumably forever) from her twin brother Shiba Shuzennosuke (Sebastian), Princess Biwa (Viola) dresses as a young man, calls herself Shishimaru (Cesario) and takes service with Ôshino Sadaijin (Orsino), who is in love with the fabulously wealthy Princess Oribue (Olivia). In the guise of Shishimaru, Princess Biwa becomes Ôshino Sadaijin messenger to Princess Oribue, but she does not love him. Instead, she falls in love with Shishimaru and in turn, Princess Biwa falls in love with Ôshino Sadaijin. But while these characters suffer for love, others lust after Princess Oribue’s wealth. Her uncle Tôin Kanemichi (Sir Toby Belch) cannot stand to see the money leave the family and tries to get her married to the obnoxious Andô Enchiku (Sir Andrew Aguecheek). Meanwhile, Princess Oribue’s steward Maruo Bôdayû (Malvolio) is also in love with her, but he is so stuck-up and out of date that the people around him plot to make him think that Princess Oribue returns his love, only making him seem more ridiculous than ever. Ninagawa Yukio is famous throughout the world for his direction of new plays and the classics, using modern theatrical techniques and traditional aesthetics with a bold visual touch. For example, his production of "Macbeth" brought the play into the world of Japan and transformed the stage into a giant Buddhist altar, with mysterious old women praying throughout the play, as though the story of Macbeth took place within the altar as a message from the land of the dead. His production of "King Lear" brought together a famous English actor as Lear and a popular Japanese actor as the fool and was performed in England, while his production of "Oedipus Rex" combined an actress from the Japanese modern theater with an actor from Kyôgen, the traditional comic style, and the production even went to Greece. This new production of "Ninagawa Jûniya", which was in fact premiered for the very first time in July 2005 at the Kabukiza, was staged in March 2009 in London at the Barbican Theater. The casting is the same as the March premiere, starring Onoe Kikunosuke as Princess Biwa and her twin brother Shuzennosuke, while Onoe Kikugorô plays Maruo Bôdayû and the jester Sutesuke. Also featuring Nakamura Tokizô (Princess Oribue), Nakamura Kinnosuke (Ôshino Sadaijin), Ichikawa Sadanji (Tôin Kanemichi), Ichikawa Danshirô (Isoemon) and Nakamura Kanjaku (Andô Enchiku)! Educational program at the National Theatre called Kabuki Kanshô Kyôshitu ("Kabuki appreciation class"). This is a very interesting formula for the beginners because there is lively presentation on stage of Kabuki or some aspects of the art like music, stage tricks or fighting scenes, followed by the spectacular drama "Kaka Saiyuki". One of the most popular Chinese classics is the story of the Journey to the West, about a Buddhist priest that traveled along the Silk Road from China to India to collect Buddhist scriptures. He is accompanied by a magical monkey spirit and some other creatures who protect him as they encounter all sorts of hazards on their journey. This play shows the group as they meet a beautiful princess, who is actually the spirit of spider. This play was originally written for Ichikawa Ennosuke’s great grandfather and was a sensation with all kinds of stage tricks. This month, it is directed by Ichikawa Ennosuke himself, featuring the younger actors of his company. Sushiya: this is one act of an epic originally written for the Bunraku puppet theatre. The full-length play shows the fate of various Taira generals in hiding after the victory of their enemy, the Genji. In this act, Koremori, the heir to the Taira clan is hiding in a sushi shop disguised as a humble apprentice, and Osato, the daughter of the house, falls in love with him. However, Gonta (Kataoka Gatô), the evil son of the house plots to gain a reward by turning in Koremori to the top Genji general Kajiwara (Kataoka Shinnosuke), but in the end, he has a surprising change of heart in one of the most heart-rending scenes in Kabuki. Yasuna: after the death of his lover, the handsome young Yasuna wanders through the open fields madly searching for his love. The tragedy is a contrast to the beautiful setting, a field of brilliant yellow flowers and the lush, sensuous Kiyomoto narrative music that accompanies it. Starring Ichikawa Ebizô in the role of Yasuna. Kaminari Sendô: handsome boatmen crossing the Sumida River were the popular idols of the Edo period, but the only thing they feared was lightning. This humorous dance shows a boatman and the thunder god carrying his drums and dressed in an animal skin loincloth. Starring Ichikawa Ebizô as the boatman. Kôjô: the close relationship between the actors and the audience is shown by these stage announcements, lavish ceremonies to commemorate various important events. In this case, this kôjô was not initially planned but was recently added because of number of swine flu cases in Kansai. Ichikawa Ebizô performs a traditional nirami no mie. It is said that if you can catch the actor eyes, you won't be infected with the new H1N1 virus. Nanatsu Men: this dance is about the Nô mask-maker Gagoze Akaemon (Ichikawa Ebizô), in reality Awazu Rokurô Saemon, who removes seven masks from their boxes, dancing their parts. Source: Earphone Guide website, except "Nanatsu Men"
The actor Bandô Takesaburô will celebrates his 77th birthday the 4th of August 2009. 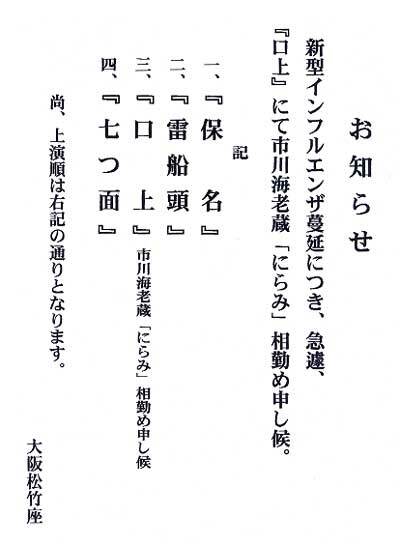 This program is Bandô Takesaburô's kiju kinen performance. 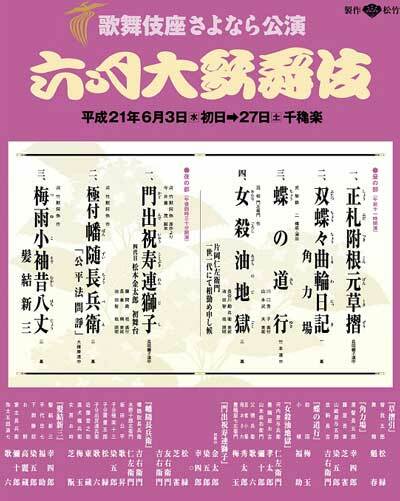 6th edition of the program of the association Tokiwakai, which stars the disciples of Kataoka Gatô and Kamimura Kichiya.